To skip ahead to the sounds you can download them here. As most of you may know I have been living in Berlin off and on for over a year now. As of today that journey has come to a close as I make my way zipping down the Autobahn towards Frankfurt. Though the speed limitless German highways don’t really give that much time for pause, I’ve managed to take a small portion of the ride to share something new on my site as well as a small sample of my time in Berlin. There’s no doubt that Berlin lives up to its über creative and dynamic reputation. As a composer/sound designer/all around audio geek, Berlin is teeming with people like me and has been a very nourishing place to grow in. Though there were a few things I still wished to have accomplished there, during my last week I did tick a big check off my list when I booked a field recording day in the city. Already having been spoiled on dramatically cheaper day to day living than in New York, audio equipment rentals were luckily no different. I nabbed a Zoom H6 field recorder, grabbed a bike rental for the afternoon, and I was off to record a farewell tour of my temporary adopted home. Other than some general city ambiences I had been determined to record all summer, my main target for the field trip was a bit of a sound designer's Mecca. 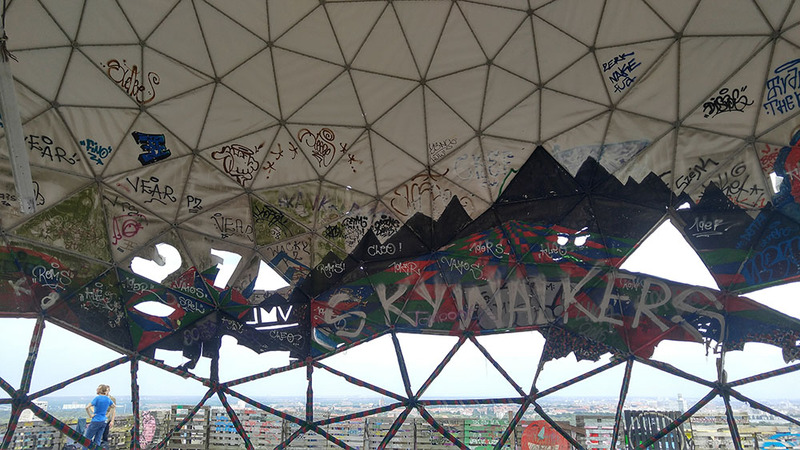 Though interest in it has widened in recent years, the very-off-the-beaten-path former NSA site at Teufelsberg still remains a fascinating abandoned place with a bizarre history and incredible street art and murals. Built atop a man-made mountain made from WW2 debris, The decaying buildings at Teufelsberg were once used as a U.S. listening station during the cold war. Much like other sites in Berlin, it is a place where history collapses with the present day in a beautifully juxtapose center out of which something new grows. For my purposes however, Teufelsberg also hails another unique feature. In the tallest structure on the site lies the main listening sphere (that looks like a dystopian version of the Epcot ball if it were a telecommunications themed ride... oh wait it is)? Inside the sphere you're met with one of the most unique and bizarre acoustic spaces you'll ever step foot in. As best described as "hearing yourself before you talk," the hexagonal mesh structured walls diffuse and reflect sounds as if you are in a real life ping pong delay verb. Sounds ricochet and melt with an incredible decay time, where even the most mundane sounds turn into resonating beauty. This was a particularly big draw for me, one that was strong enough to have me nearly crash my bike through the overgrown Grunewald forest pathways while being sucked dry by mosquitos to get there. As with any field recording, you're either limited or delighted by the environment you're trying to record. I did have some specific "wouldn't it be cool to record this" ideas for going there, though not having any idea how crowded it may be I knew I would just need to improvise. I was surprised to see quite a few tourists, as it is a difficult place to get to. I also wouldn't think of Teufelsberg as a particularly family-friendly spot, though many families and children found their way up the stairs and into this strange place. After making the big climb to the sphere, without headphones or recording engaged, I was immediately taken aback by how strange it is to hear your own voice as if you were whispering in your own ear. Not being the only person there, others started to gently play with this strange phenomenon as well. As I pulled the recorder from my bag, more and more people started to pile in. At first I thought I might have lost an opportunity to get some sounds, but then I placed the headphones on and started recording. What followed was not so much a directed foley session, but more of a passive human observation experiment. Adults and children aligned with the same sense of wonder and excitement at what they were experiencing. From whistling, snapping, shuffling, prodding, screaming and singing, people found new ways to express themselves. Even a family dog had to bark a few times to hear how it sounded. Sonically the result was more than I could have ever asked for from a field recording, and much more interesting than me dropping a few metal pipes by myself. These recordings are incredibly useful on their own, but crazy things start to happen when you mess with them in post. Just a simple varispeed effect on some of the vocal sounds creates the most eerie and twisted sound palettes. Through effective layering and editing you can create industrial ambiences suited for the likes of Playdead's industrial masterpiece Inside. The woman who spontaneously started singing a medieval ballad is also a particular favorite that can be used in so many sound design applications. As I've had a great time with these files already, this has prompted me to open a new section of my site so that I can share it with you. Introducing the brand new Downloads page, where you can download all of these recordings and more for free. I am still working on the Berlin Ambience digital download, but for now I hope you enjoy the Teufelsberg recordings as much as I have. From children to adults, we all react to sound in unique and personal ways. Anyone who has found themselves singing in the shower can attest to this. Acoustic spaces do something to our sense of self-- we can break free from doubtful bonds and hear ourselves outside of our own likeness. 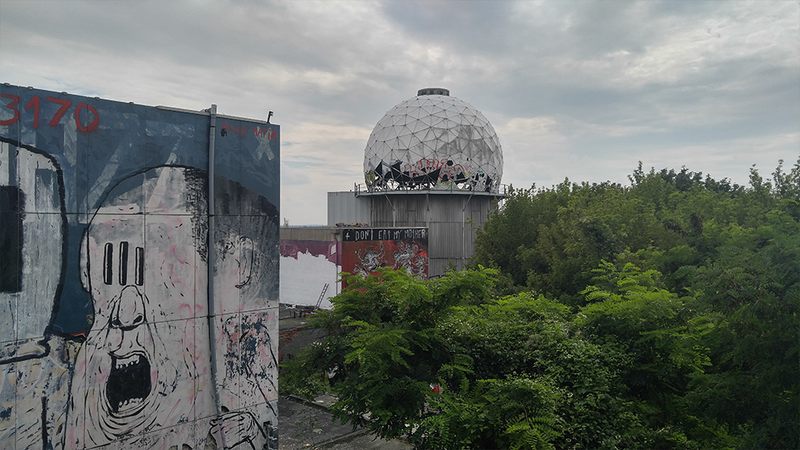 The next time I throw on a digital or convolution reverb onto a track, I'll always think of my trip to Teufelsberg knowing what a real reflection can make you feel. Scoring "The Girl Who Loves Roses"
Though it has been quite a bit of time since introducing this section of my website, I could think of no better way to revive it than to talk about an exciting project I had the chance to work on recently. This Spring I had the pleasure to compose the music for a short film biography of the extraordinary young artist Panteha Abareshi. Produced by The Front and directed by sisters Kelsey and Rémy Bennett, this amazing short film depicts the artist's inspiration and story told by Panteha herself, while throughout the film recreating live action interpretations of her artwork. Panteha's art blends her own intense physical distress from living with sickle cell disease with images of empowered women of color. There are overtones of mysticism and myth that touch corners of her personal life while acting as a conduit for expression. Her work reaches so far beyond that of anyone her age, which few people at 17 can say they have already had a featured solo exhibit in New York City. As a composer, I was very fortunate to have been able to be a part of telling her story in this beautifully crafted film. I was introduced to Panteha's artwork when Kelsey approached me about doing the music for the film. Usually, when I begin composing for a film or any visual media project, there is often a rough cut of footage to work from. I would take the cut and jot down major transitional cuts or moments that needed some score element to coincide. With "Girl Who Loves Roses" however, we used the mirror image of this workflow. The film would be cut to a sonic template that I set, which inevitably created a much broader sense of freedom during the initial writing phase. Using this method was an amazing learning experience for me, as I realized how much I normally write from visual cues. The source that I was given was Panteha's artwork, which while not in a video timeline just yet, provided a powerful starting place for me. It was a very liberating process to think about a piece of music as it relates to an artist's work more than how it fits in a discrete timeline. This made the moment I first got a chance to see the first cut of footage with the music all the more rewarding! Kelsey, Rémy and Panteha worked together to create meticulously crafted set pieces and costume design that perfectly capture the nature of Panteha's work. At the time of my first draft, Kelsey described their film shoots as combining sterile hospital imagery with mysticism and religion. The hospital is an important element in her art and in the film, as it ended up acting as the "studio" where much of Panteha's work was created while being treated for her illness. In order to convey the more mystical aspects of Panteha's work the sonic base for my piece needed to be ambient in nature, but also had to involve elements of distress and uncertainty. I was excited when Kelsey mentioned the transposing moods of Twin Peaks composer Angelo Badalamenti as a reference, as I and virtually any electronic composer has been influenced in some way by his iconic scores. The guitar line is a light gesture towards the intro theme music of Twin Peaks. To create the more dissonant counterparts that would evoke the atmosphere of distress and hospital-like drones, I wanted to employ a more vintage inspired synth sound source than overly literal hospital sounds. I decided to source my sound design from my painstakingly recreated Reaktor version of the legendary EMS Synthi A. It is a massive project I've been working on in Reaktor for months that aims to give the same functionality (and hopefully sound) of the iconic synthesizer. Known for its ability to create complex textures and effects, the Synthi A proved to be a very effective tool in this piece for creating the noise drones and almost alarm like modulations speckled throughout the piece. Stay tuned for more info about this Reaktor project, as I will be sharing it to any Reaktor users out there very soon! The theme of imposing religiosity was also an important part of the score as it relates to Panteha's work. While keeping the dark, off-kilter textures throughout, I included a secondary section that modulates around a church-like choral. My aim was to evoke the harmonic quality of a church organ composition with strange vocal elements shifting away from the traditional and into something more individual. It would be an understatement to say that this was a great project for me to have been a part of. Not only did I get the opportunity to learn about a new artist, I also had the opportunity to write a piece of music from a very different source medium all together. As a potential exercise for future compositions, I will definitely try using this technique again, as I feel that I've gained so much from the process. Here's the score by itself on Sound cloud, and definitely check out the whole film here. Kelsey Bennett and I have also collaborated on prior music projects together including a series of tracks that sampled our favorite horror films like Poltergeist and Rosemary's Baby. She later combined this with her work as a photographer, producing the Poltergeist themed series "They're Here!" You can check out a short behind the scenes video she made with our track here. I cordially invite you to the all new glennforsythe.com! I have created this site for my work as a composer, sound designer, producer and all around audio geekery. Like many I've jumped on the Squarespace bandwagon, which considering I wouldn't like to spend my days futzing with HTML to make something semi-presentable, was a very good choice. Though I wish I was a bit CSS savvy, google has and always will be an amiable companion for the lazy like me.